Dayton Ballet is thrilled to present Perspectives, a repertory dance program comprising four distinct ballets from four incredibly talented choreographers. Considered culturally ahead of its time, Trinity is a ballet choreographed by the late Gerald Arpino, co-founder and former Artistic Director of the Joffrey Ballet. While the Vietnam War was raging, America's youth united through protests and celebrations with a new sense of freedom and exhilaration. The word “trinity” in this work represents three sentiments prevalent in the culture of the late ‘60s and early ‘70s: love, power, and peace. Trinity became the most famous of the Arpino pieces known as The Berkeley Ballets. Created during the Joffrey Ballet's residence at University of California at Berkeley, Trinity is a joyful tribute to youth, their passions and their rituals. Violin Concerto is a classical ballet choreographed by former Dayton Ballet dancer Justin Koertgen. Set to excerpts from Bruch’s Violin Concertos Nos. 2 and 3, this beautiful ballet features four couples in classical ballet attire. Having danced in the premiere of this work, Dayton Ballet’s Paul Gilliam will set this ballet for the four couples presenting this exquisite piece. DPO Concertmaster Jessica Hung will be the violin soloist, providing the irresistible combination of dance to live music. Former Dayton Ballet dancer Case Bodamer was born and raised in Blue Point, New York, where he began his ballet training with Kathleen Kairns-Scholz at the American Dance Theatre of Long Island. He spent summers training at The Juilliard School, Ballet Austin, and New York State Summer School of the Arts. He also studied at The Ailey School and with The Ailey/Fordham BFA Program until he accepted a traineeship with Ballet Austin. Professionally, Case spent his summers dancing with Ballet Montana, The Dayton Arts Project, and Boulder Ballet. While at Dayton Ballet, he was an honored recipient of the prestigious Josie Award, established by Dayton Contemporary Dance Company founder Jeraldyne Blunden to recognize individual excellence in the art of dance. Named in tribute to Josephine Schwarz, the Josie Award acknowledges the significant contributions of dancers to the Dayton community, while paying homage to a pillar in the dance world. Case danced with Dayton Ballet for ten seasons, and he is thrilled to be returning to Dayton Ballet to choreograph this world premiere, his first major work since retiring as a dancer this past May. Mariana Oliveira is the Choreographer and Artistic Director of The Union Project Dance Company. Originally from Brazil, Mariana studied at the Royal Academy of Dance in London and was a trainee dancer at the National Dance Company of Wales. At the age of 19, she was invited to perform with the Cuban Classical Ballet of Miami. In 2007 she moved to New York, and two years later she founded The Union Project Dance Company. Since then, Mariana has been commissioned to create new works for the Richmond Ballet, Kansas City Ballet, Milwaukee Ballet, Joffrey Ballet Academy, National Choreographers Initiative, Ballet Arkansas, and A&A Ballet. Mariana is a recipient of the NYU Center for Ballet and the Arts Fellowship as well as the Kansas City University Choreographic Fellowship. Her works have also been presented at the Jacob’s Pillow Dance Festival, and for two consecutive years she has been a finalist of the McCallum Theatre Choreography Festival. Mariana taught at the Bolshoi Ballet School in Brazil, the only Bolshoi School outside Russia, for the dancers of the Youth Company. She makes her first visit to Dayton with a world-premiere work for Dayton Ballet. Before each performance, Dayton Ballet Artistic Director Karen Russo Burke will hold a pre-performance talk called “The First Step,” giving audience members a more in-depth look at the upcoming performance and a behind-the-scenes peek at Dayton Ballet. “The First Step” will be held 45 minutes prior to curtain time for each performance in the Burnell Roberts Room at 126 North Main Street, beside the Victoria Theatre. “Behind the Ballet,” a Q&A with dancers that gives audiences the opportunity to learn more about the life of a dancer with Dayton Ballet, will follow each performance in the theatre. 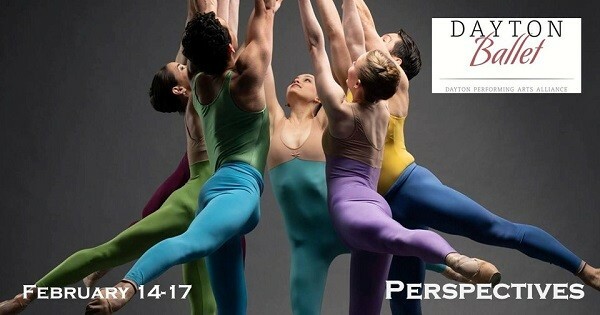 Find more events like "Dayton Ballet: Perspectives"
1937-2011 - Dayton Ballet, one of the oldest and finest professional dance companies in the United States.